On returning to England in the spring of 1939 I found that my father had somewhat wrecked the Riley San Remo I had left in 1935 (he was a great cyclist who never quite mastered the automobile) and now had an Austin 7. I quickly set about flogging this for a. . .
A similar Riley 14/6 Alpine Tourer of 1933 vintage. This second Riley was a later and more rugged beast, with a 6 cylinder engine and a metal body. One of the world's great cars, another Rally winner, (though the one I got had been one of the world's great cars for a large number of owners and years). Sporty, 4-seater sedan. 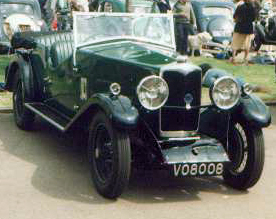 Notable in the outside appearance, in addition to the distinctive and beautiful Riley radiator treatment, was the generator, mounted directly on the front of the crankshaft and housed in a massive chromed torpedo poking out of the front under the radiator grille. The cranking handle, when needed, fitted into the front of this torpedo (after unscrewing a nosecap) and you cranked the engine through the generator. That is the car in which I met Mother on the dock in Southampton in 1939 as she disembarked from the Imperial Airways flying boat after her journey from Hong Kong. This is also the car in which she, I, and my father drove to Southampton in September, after the war had broken out, to board our Cunard "Aquitania" to the US and a new life. The sailing was being delayed while they mounted guns on the foredeck, so we took a room that night and, next morning, drove to the outskirts of the city, pointed my father in the direction of Hereford, and, with a silent prayer, sent him on his way. He got home safely, put the car on blocks, and never used it again, selling it at the end of the war when such things were in short supply. It was also to be 15 years before I would see my father again.